A BallJacket is a tight-fitting, heavy-duty cover for a standard exercise ball. It's made from the same abrasion-resistant fabric (1000 Denier urethane-coated nylon) that's used on the most expensive backpacks and toughest military gear. 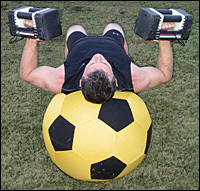 A BallJacket will turn your exercise ball into a nearly indestructible training tool for use indoors or outdoors. It's a frustrating experience to invest in a high-quality exercise ball and then see it deflate when you accidentally roll over a loose staple or other debris left on the floor. And it's a shame that your exercise ball isn't durable enough to use outside for spring and summer workouts. BallJacket changes that with a rugged, tight-fitting cover that protects your exercise ball from cuts, scrapes, and punctures. If you want to extend the life and usefulness of your exercise ball, put a BallJacket on it! Each BallJacket has a Velcro-sealed opening that's just big enough to insert a deflated exercise ball. After inserting the ball, you inflate it as you normally would, then close the Velcro flap. The BallJacket will fit the ball like a finely-tailored glove, and protect it like a coat of armor. The surface of the BallJacket resists most stains, and won't support the growth of mold or mildew. Dirt can be hosed off or removed with a wet cloth. For more complete cleaning, throw your BallJackets in the washing machine (after deflating and removing the exercise ball). Firmer exercise balls are preferred by most fitness professionals, because they roll more easily when loaded -- e.g. when you're lying on them, doing dumbbell presses. This freedom of motion makes ball exercises much more challenging and productive. A BallJacket will not only protect your exercise ball, but also make it considerably firmer. A BallJacket will turn even the softest, squishiest, low-cost ball into something you'll be proud to use. Don't be stuck with the ugly-colored exercise ball that you bought at the local fitness store. Cover it with a BallJacket. Tired of looking at the collection of mismatched exercise balls in your gym or clinic? Cover them with BallJackets! The BallJacket's surface has a texture and feel similar to upholstery material. This also makes it perfect for covering the balls used in ball chairs. It eliminates the ball's slick, squeaky feel, and gives you the chance to pick colors that blend better with your office decor. BallJackets are even durable enough to handle contact with the nails, hooves, and teeth of many animals. If you have big dogs, you already know how hard they can be on toys. They can destroy a basketball, beach ball, or a regular exercise ball in just a few minutes. But they won't hurt a BallJacket-protected ball. It's too big for them to get their teeth into, and their nails won't penetrate the surface. Nearly all exercise balls have their size (in centimeters) marked somewhere on the ball. 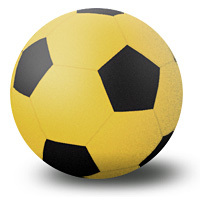 This size marking is usually near the ball's inflation valve or logo, and will most commonly be 53 (or 55), 65, or 75 cm. Order your BallJacket in the same size as your exercise ball. If the size is not marked on your exercise ball, use a yard stick or tape measure to determine the approximate height of the inflated ball. This measurement doesn't need to be exact, just close enough to determine your ball's nominal size.